This is a very special photo to me. 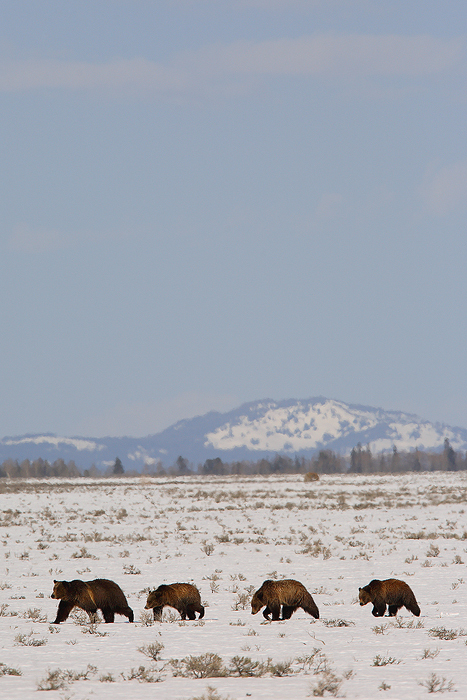 The four grizzlies in this image are bear # 399 and her 3 cubs crossing the sagebrush flats in Grand Teton National Park. I feel extremely privileged that I had the chance to view and photograph this amazing bear family. Spring of 2008 was her third spring with her cubs, and they only stayed with her another couple weeks after I took this photograph. Bear 399 became somewhat of a celebrity in recent years, due to the fact that she was often spotted with her offspring close enough to the road for good viewing. In Wildlife photography, It's unusual to "know" one animal from another, but in the case of bear 399 it is hard to deny that she is special.